If you’ve made a delicious cake that’s in need of a finishing touch to get it ready for a party, or if you’ve spent hours creating yummy cupcakes that need something extra special to complete them, then we’ve got the tutorial for you! Today, Kathy Hodson is going to show you how to create some cake toppers that are guaranteed to take your cakes to a whole new level! Perfect for any celebration, these cake toppers are easy to make but they’ll make a big impact. Using one of the latest paper pads from First Edition, Let’s Celebrate, this is a really quick and easy DIY. We love the papers’ pastel colour scheme, as well as the variety of ‘party animals’ that feature that we have fussy cut here to make these toppers! 1. Find the sheet of candles paper within the 12” x 12” Let’s Celebrate paper pad. Cut a strip of paper as wide as one row of candles and along the whole width of paper. Turn the remaining paper over and, using a large tape reel as a template, draw around the outside to create a circle. Cut out the circle slightly larger than the pencil line and then snip into the edges to create tabs. Punch, or use a craft knife, to create a hole large enough to slot the dowel through. 2. Fold in the tabs around the circle. 3. Apply a piece of thin Perma-Fix tape along the length of the reverse of the candle paper strip on the top edge and slowly fix each tab to create the bottom tier of the topper. 4. Repeat the above steps using the turquoise foiled triangle paper with a reel of washi tape as a template to create the top tier. 5. Cut the bamboo dowel to 20cm and wrap with pink washi tape. 6. Fussy cut the panda holding balloons from the pad and fix to the base layer of the topper using double-sided tape. Cut the presents and hat out again from the same page and fix on top using foam pads to create dimension. Cut out some presents from the patterned gift box papers and fix in the same way. 7. Fussy cut the flamingo on a bike with balloons and fix to the top of the bamboo dowel. Add a die cut ‘Happy Birthday’ sentiment between the top tier and the flamingo. 8. Poke the bamboo dowel through the holes in the tiers and place to the top tier on top of the bottom tier. The dowel will need to go past the bottom tier of the topper as there will need to be a small section inserted into the cake to make it stand up. You might find it helpful to rest your cake topper and dowel on top of a bottle or a glass to keep steady while you complete the remaining steps. 9. Fussy cut smaller pandas and flamingos from the Let’s Celebrate pad and fix to the back of cocktail sticks with tape to create matching cupcake toppers. You could also create cupcake wraps using an electronic die cutting machine such as the Cricut. 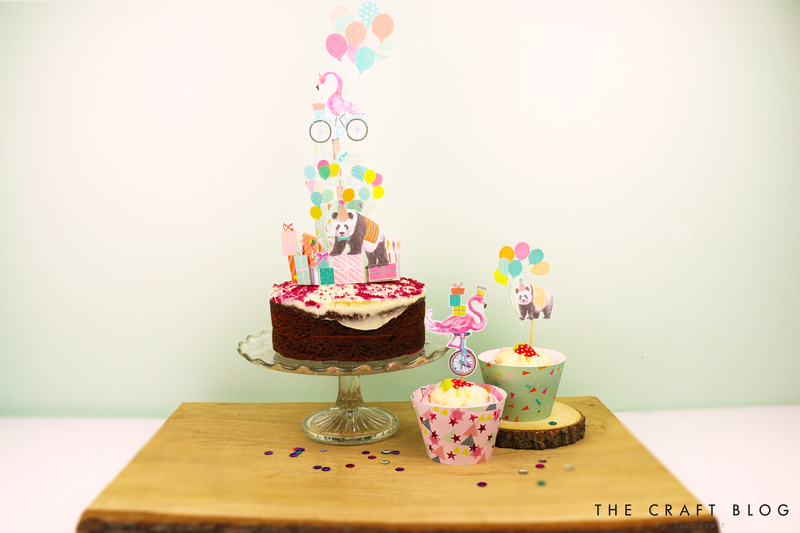 Will you be creating your own cake toppers from the Let’s Celebrate paper pad? We’d love to see if you do, so don’t forget to #Trimcraft when uploading to social media and to share your projects in the Inspiration area. These are so cute and beautiful, and I´m sure the kids would love these, and also for their birthdaycakes too, I´m sure.